Delicious vegan food can be found in the English city of Oxford. Many tourists enjoy visiting Oxford to see the university colleges, Harry Potter filming locations, enjoy punting on the river and taking photos of the beautiful sandy architecture. 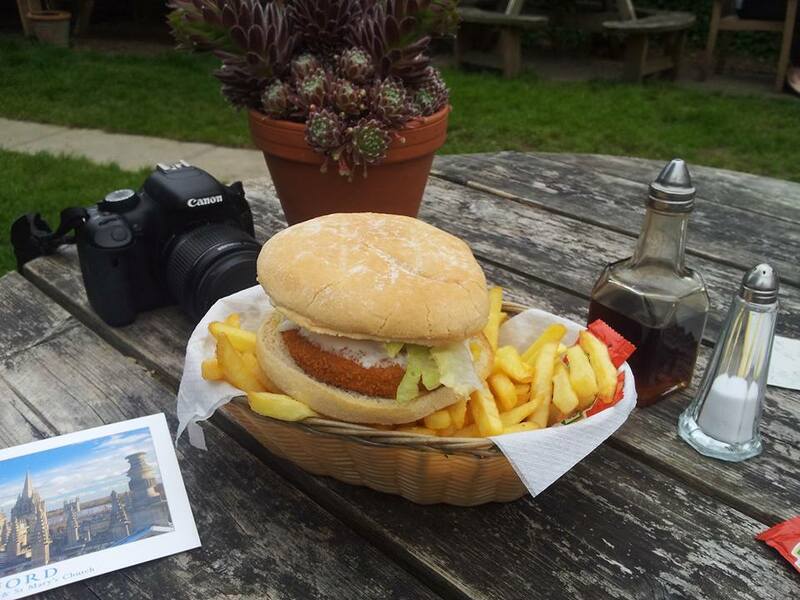 Yet make sure you fuel your Oxford sightseeing with some of fantastic vegan food. 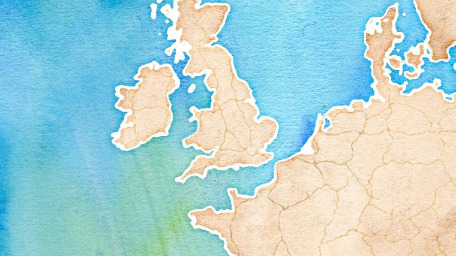 There are a few independent vegetarian restaurants and pubs in Oxford, as well as Oxford’s first 100% vegan restaurant. 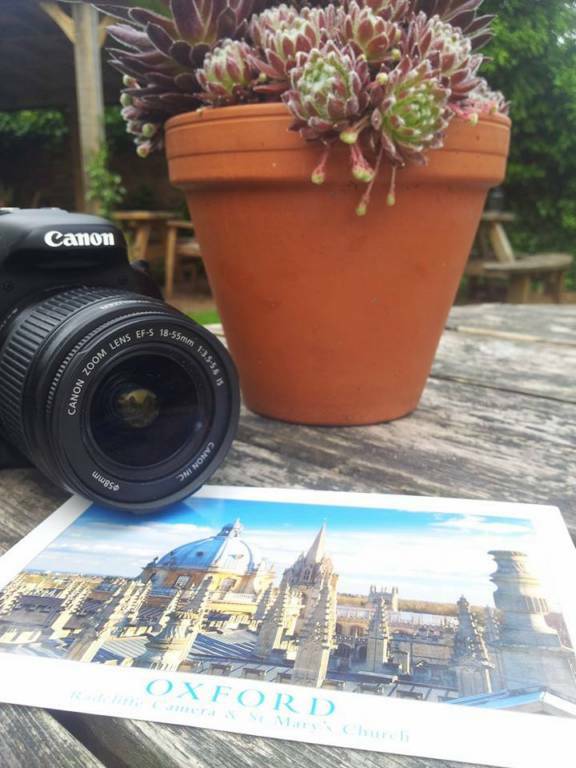 Read this post to see how you can visit four vegan-friendly places around the city of Oxford. Start your vegan journey around Oxford with a hearty vegan breakfast at Rick’s Vegetarian. Rick’s Vegetarian is a smaller veggie version of Rick’s Diner. There are several vegan breakfasts on offer such as slow-cooked spinach, vegan full English and vegan pancakes! We tried the vegan breakfast and the vegan pancakes. Whilst the service was pretty poor as the waiter kept forgetting items and giving the wrong dishes to the wrong diners, the food was incredible and fantastic value! The traditional vegan English breakfast had a fantastic middle Eastern twist. There were the standard beans, hash brown and mushrooms on the plate. They were joined by fluffy falafel, creamy hummus and toast spread with oil and sesame seeds. At only £7 there was plenty to munch on and it was all packed with flavour. We both loved the addition of hummus to the vegan fry up! It was nice to have a slightly different take on the tradition English breakfast. We both very much enjoyed the vegan breakfast at Rick’s Vegetarian. If you want to read about another epic vegan breakfast, click here to read all about a vegan breakfast in Cardiff we tried. Not only were the vegan pancakes incredibly aesthetically pleasing but they were also incredibly delicious! The pancakes at Rick’s Vegetarian are the best vegan pancakes Alex and I have eaten in the UK. Whilst we still could not decide if they were as good as the pancakes at GoodSoul’s in pancake they were certainly fantastic. They were light and fluffy. There was not an overwhelming banana taste which is normally prevalent in vegan pancakes. The fresh fruit complimented the pancakes well. We also like the vegan vanilla yogurt when it was eventually brought out! Along with the vegan breakfast and the vegan pancakes we also sipped on a cappuchino made with oat milk. If you are a coffee fanatic you may enjoy this post about accidental vegan coffee in Sarajevo, Bosnia! Our whole meal came to just £16 which is not bad for the pricey city of Oxford. We would wholeheartedly recommend the food at Rick’s Vegetarian. The service is still having teething issues as the restaurant is still fairly new. I am certain once the service is up to scratch it will be almost impossible to get a seat here without booking in advance! The restaurant can seat around 16 people so get there early for the vegan breakfast or book in advance. Rick’s Vegetarian serves one of the UK’s best vegan breakfasts so you must check it out whilst you are in Oxford. If you are looking for an authentic vegan pub experience you should check out the Vegetarian Gardener’s Arms in Oxford. The Gardener’s Arms has been vegetarian since 2012 and offers a range of vegan options. The serve an array of dishes from around the globe such as the Thali Platter, Italian Flatbreads and American Veggie Burgers. The flatbread and burgers are really good! The veggie burger was incredibly tasty. The chips were good, but the burger was the start of the show. 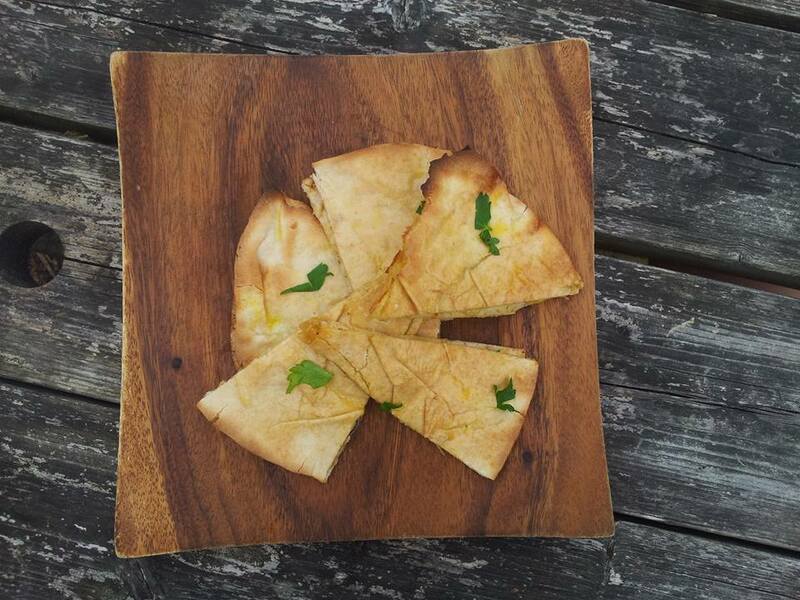 We brought some flatbread to share which was very crisp and very garlicy. In terms of what they offer vegans to drink, alongside the traditional British ales there is also a selection of vegan-friendly wines. Set in the north of the city in the arty Jericho area the gardener’s Arms is a traditional British pub known for its great vegetarian food and relaxed atmosphere. Inside the pub still has its original wood décor and is decorated by the landlord’s vinyl collection! There are also well stocked bookshelves and DVDs which customers can swap with their own. If you happen to visit on a sunny day you can sit on the only grass lawn beer garden in the centre of Oxford. The outside area is just as relaxing as inside. The Gardener’s Arms hosts many events such as poetry nights, music events and a weekly pub quiz. Visit the Gardener’s Arms for an authentic British pub experience with yummy vegan food! Refuel on vegan cake during your site seeing around Oxford at the Art Café. Art Café is very centrally located on Bonn Square, just a stone’s throw from Oxford castle. Pop inside this bustling café and try one (or two or three!) of their vegan cakes. We opted for the chocolate and conut slice as well as the apple and date slice. They cost £2.75 each which we ordered to take away. We took our cakes down to Christ church meadow and sat on a bench overlooking the river. From here we had a good view of tourists trying to punt along the water. It was very entertaining to watch! The chocolate coconut slice was fantastic. It was essentially a flapjack coated in chocolate with coconut flakes on top. Not too greasy and very tasty I absolutely loved the vegan chocolate and coconut slice. I think I will have to update ourbest vegan cakes in the UK blog post as this needs to be on the list! Art café is perfect to grab a tasty vegan sweet treat from to fuel your wanderings around Oxford. If you are in the mood for vegan comfort food whilst you are in Oxford, look no further than Happy Friday Kitchen. Happy Friday Kitchen is the only 100% vegan restaurant in Oxford. Located just outside the city centre there is a range of decadent fast food to try. The want to promote a vegan lifestyle through serving a range of calorific junk food. The menu at Happy Friday Kitchen is inspired by Californian comfort food meaning there are plenty of pizzas and burgers on offer. We opted for two different burgers with loaded fries and a side portion of cauliflower bites. The Big Mac Burger at Happy Friday Kitchen is a seitan burger filled with lettuce, sauce and mac n cheese! This carb heavy dish requires a hefty appetite in order to finish! The seitan burger is nice. The seitan is chewy and quite soft with nice seasoning. The mac n cheese was incredible! I think I would rather have just had a huge bowl full of mac n cheese instead of the burger! We were both given a gigantic portion of fries! The tin was almost overflowing with perfectly crisp and salty chips. Neither of us could finish our portion and we had to ask for boxes at the end to take the fries home. We got one of the portions as loaded fries which meant they came with melted cheese, pulled jackfruit and jalapenos. The melted cheese was incredible! The cauliflower bites were yummy. There was a nice drizzle of siracha on the cauliflower and the bites were coated in a light batter. They probably could have been a little spicier and crispier, but they were still tasty. For our drink we had an epic hot chocolate. Topped with vegan cream and vegan marshmallows this was vegan hot chocolate heaven! We were too full to any of the vegan desserts, but I would have loved to if I had had space in my tummy. They even had a vegan pick n mix selection of sweets. We really enjoyed the fries, mac n cheese and hot chocolate at Happy Friday Kitchen. It is quite pricy, but the portions are generous. It’s a great place for great cheesy American comfort food. Also, it’s fantastic that the city of Oxford now has a 100% vegan restaurant! What vegan food would you like to try in Oxford? Whilst there is only one 100% vegan restaurant in Oxford at the moment, there are plenty of veggie places or vegan-friendly restaurants in the English city. If we had to pick a favourite place, food-wise we really enjoyed our vegan brunch at Rick’s vegetarian. The hot chocolate and mac n cheese at Happy Friday Kitchen were incredible. The cakes from Art Café were yummy as was the crispy flatbread at The Gardener’s Arms. 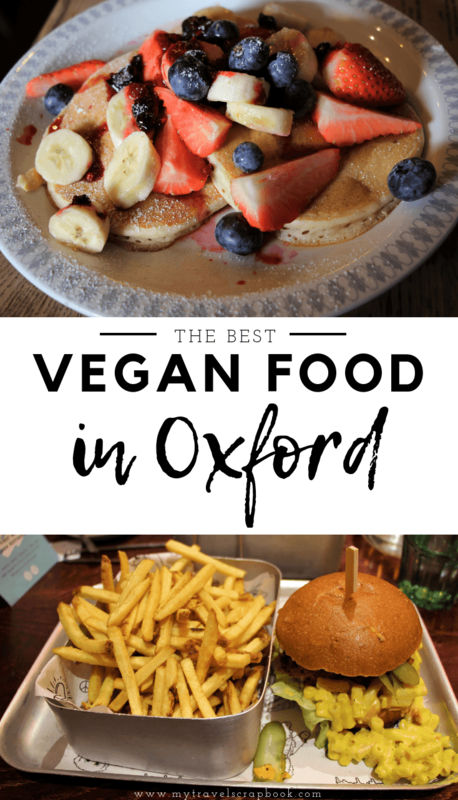 Which vegan food would you like to try in Oxford? Let us know in the comments below!